A-Line design and color block detail,a charming look and brings out your elegance and natural confidence. 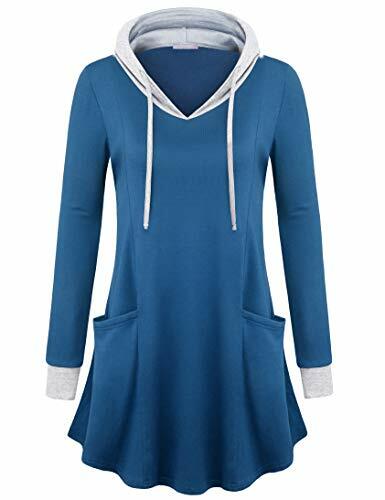 M:---Length--32.3" Bust--35.4" Sleeve--24.0" Shoulder--15.4" Hem--55.9"
L:---Length--33.1" Bust--37.8" Sleeve--24.2" Shoulder--15.7" Hem--58.3"
XL:--Length--33.9" Bust--40.2" Sleeve--24.4" Shoulder--16.1" Hem--60.6"
XXL:-Length--34.6" Bust--42.9" Sleeve--24.6" Shoulder--16.5" Hem--63.4"
Furnex is dedicated to provide women's clothings with premium quality materials and original design. If you have any inquiry during your purchase please feel free to contact us, and we will be more than happy to assist you.